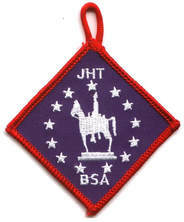 THE JOCKEY HOLLOW TRAIL PATCH!! ​What?? You're telling me that Scouts and earn a patch for completing the 5 mile hike?? Oh yeah! Patriots Path Council offers the award as one of several historical hikes offered in New Jersey. Pack 133's own Tom Shaw prepared a presentation (below) to train Cub Scout leaders at the University of Scouting. Check it out!